Green Supply Chain News: Just How much should Water Cost? Green Supply Chain News: What are the top Green Trucking Fleets for 2018? While of course the most prominent area of Green supply chain focus is on fuels and CO2 emissions, issues relative to water usage, ownership, costs and more are getting a lot more attention is recent years. 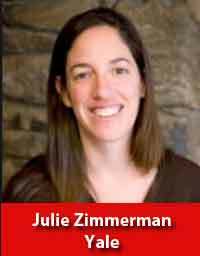 Dr. Julie Zimmerman, a professor of green engineering at the Yale School of Forestry & Environmental Science, recently joined one of Yale’s Global Leadership: Big Issues course, where she had some very interesting thoughts on water. If I solve my water-use problem, it should also solve my energy problem, which will solve my climate change problem. “If you go back and you look at the UN sustainable development goals, the number of people with access to clean water has doubled in the last 20 years. So that’s people who will now have 20 liters per person per day, but there’s still over a billion people who don’t have access to safe water. So it’s about 20% of the population. “This is a really interesting debate that continues to rage. It’s been slowly, I would say emerging, but is becoming more and more prominent. This idea of whether water is a public good or a private good, and so there is the debate that water should not be privatized, commodified, traded or exported in bulk for commercial purposes: it is a public good. “And the other side of this said, water and food are basic rights, we pay for food, why should we not pay for water? It’s really interesting and that is where the model’s evolving to is these public-private partnerships. It becomes interesting because you need good government oversight and regulation and then the pricing structure becomes really important. “Just like you talk about embedded carbon in products, we talk about embedded water. Just like you do a carbon footprint, you can talk about a water footprint of a product. How much volume of fresh water is used to produce that product over the production chain? Whether I’m growing crops and I’m harvesting them like cotton and I’m processing them, how much irrigation water goes into that crop? If I’m mining, how much water am I using in that process? Like using cyanide to get gold and how much water am I consuming in that? Or energy production, how much water am I using in fracking and how do I account for that water across the entire supply chain? “And then you can also ask questions about where that water’s coming from. Because we know the geographical distribution of supply chain, I can say that’s coming from a scarce basin or not. We know there’s water dependency. Most countries in the EU, North Africa, and the Middle East are dependent on water resources in other parts of the world. So just like oil is found in the Middle East, you can start asking about which countries are water rich and are really good at exploiting that resource and selling it to the rest of the world. “And then you can start to ask questions about from a global perspective, is virtual water trade a mechanism to increase global water efficiency? What’s the risk of shifting our environmental impacts from producing in our own country to somewhere else? And then from a national perspective, not my academic environmental perspective, is this a solution for me as a water-scarce country and what is the risk of becoming water dependent? Of saying, “For my water resource benefit I’m going to import those crops, that food, those products from somewhere else,” and am I setting myself up for an alliance relationship where I’m at a disadvantage because I need food to feed my people and I have now said I can’t grow it or it doesn’t make sense for me to grow it in country. I’m going to import those goods. “California, two years before the drought, set audacious carbon goals that they were going to reduce carbon emissions from the state of California and they spent tens of millions, hundreds of millions of dollars upgrading the energy grid. So California’s energy efficiency programs, here’s what they spent; here’s gigawatts of energy they were able to save off the grid. Here’s the funding they put in. So, $1.5 billion in 2006 to 2008. Here’s the cost per kilowatt hour that they spent saving those carbon emissions off the grid. “If I solve my water-use problem, it should also solve my energy problem, which will solve my climate change problem. But we don’t think like that, right? The carbon goal has to come from the energy sector. They never ask the people in the Department of Environment, can you realize these carbon goals through water savings? And they spent all that money and if they had done it through water use, they would have saved money and they would have been better positioned for the drought. So we don’t think about this nexus perspective from a government management at all in terms of these resources and we’re often wasting a lot of money because we don’t think about that nexus. It is clear water management and private and public policies will do nothing but grow in importance. What is your reaction to Dr. Zimmerman’s comments? Let us know your thoughts at the Feedback button below. No Feedback on this article yet. Join the thousands of professionals with (free) access to great articles linke this one. Home | Contact Us | Advertise with Us © 2009 GreenSCM. All Rights Reserved.